The Tone Corset's four-knob design provides excellent control and gives the user the ability to precisely shape their instrument's dynamics. Compression effects ranging from subtle to extreme and all points in between are possible. The pedal's Sustain knob controls the amount of compression applied to the guitar signal. The Attack knob adjusts how quickly the compressor recovers. As Attack is turned clockwise the pedal's response is slower and more initial pick attack comes thru. The Blend knobs adjusts the mix of the dry and compressed signals. By blending both the player can achieve a sound where the dry signal allows the natural pick attack to come thru while the compressed side turns up the volume as the note decays. Volume adjusts the overall output level of the effect. A Pad switch pads down the input signal to prevent undesirable distortion when the pedal is used with high output humbuckers, bass guitar, etc. 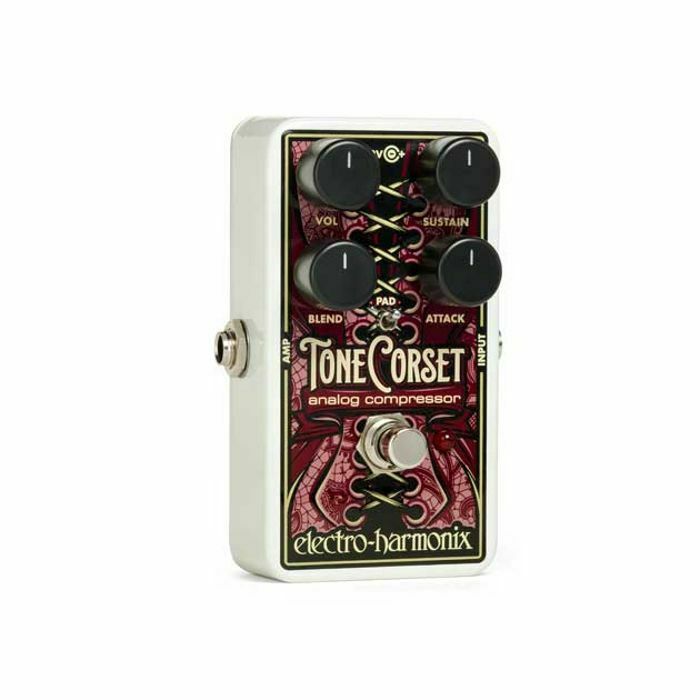 The Tone Corset features True Bypass switching to ensure maximum signal path integrity and comes with a 9 Volt battery.